Want to get a memento from the Chicago Bears winning game against the Baltimore Ravens while simultaneously helping out victims of the tornadoes that ripped through Illinois Sunday? Now’s your chance. The Bears are auctioning off game-worn and game-used equipment from their overtime win against the Ravens Sunday to help with the relief efforts in central Illinois. Among the items in the auction are game-worn jerseys from David Bass, Alshon Jeffery, and Julius Peppers, game-worn pants from Bass, Peppers, Matt Forte, Kyle Long, Brandon Marshall and Josh McCown, a game-used coin, and a game-used football autographed by Head Coach Marc Trestman. The jerseys will be autographed and have been washed, according to Scott Hagel, vice president of communications for the team. 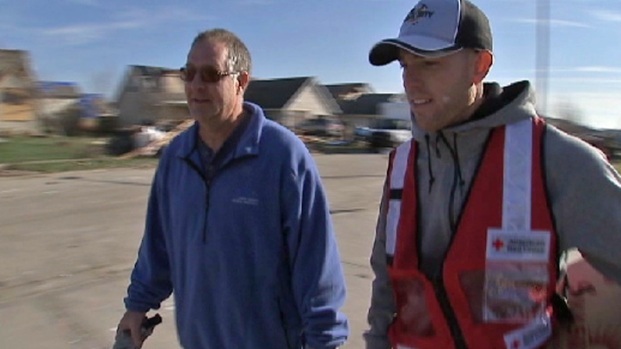 Robbie Gould and some former Bears hit Coal City to help with cleanup and to cheer up tornado victims. Peggy Kusinski reports. “You can tell what kind of game they played in because not even the best detergent could get that out,” he said. The St. Louis Rams also donated a 16-person suite to the auction for this weekend’s game and the team expects more items to be added for the auction ends. The Chicago Bears and Bears Care said they will match all donations and auction proceeds up to $100,000, which will be sent to the American Red Cross to “address the most current critical needs of the families who have been impacted by the tornadoes and storms,” the team said in a release. Bids were being accepted Wednesday and the online auction ends Nov. 24 at 11:59 p.m. Earlier this week, Robbie Gould, Zack Bowman, Blake Costanzo, and Sherrick McManis, along with former players Anthony Adams and Rashied Davis, traveled to Coal City to help with relief efforts. The players served meals and distributed supplies from an American Red Cross Emergency Vehicle. Fore more ways to help click here.